In the French city of Carcassonne there is a castle that looks like it has been pulled straight out of a storybook. For Cynthia Caughey, the 13th-century castle, known as the Cité, is just a part of the backdrop of everyday life. Originally from the U.S., Cynthia funds her life in France as a grant writer and consultant for nonprofit organizations. She also serves as an expat advisor. After nearly a decade abroad, which included three years living in Italy, she has written an e-book. “I wrote [the book and Udemy course] because I had done years of research about living in France and also Italy,” Cynthia explains. “I wanted to share what I had learned from all that research.” As a result, she has created multiple streams of income. 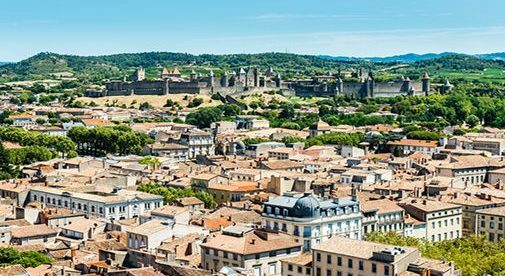 With its historic Canal du Midi lined with plane trees, rich wine tradition, dramatic historical sites, and ample sunshine, it is hard to believe that Carcassonne and the broader Languedoc region of France can be affordable. However, Cynthia describes a very reasonable cost of living. “I spend about $375 on food a month, $60 on electricity, $50 on car insurance, $20 on home insurance, and $80 on top-up medical insurance. My internet, cable TV, and cellphone package costs me just $45 a month,” Cynthia says. Cynthia currently lives in Carcassonne’s city center, but recently purchased a home in the nearby village of Trèbes, next to the Canal du Midi. She is refurbishing the house and plans on moving into her new home in a few weeks. Transportation is relatively easy in Carcassonne, thanks to France’s comprehensive mass transit system, so owning a car isn’t necessary. “In Carcassonne, I don’t need a car because of the buses and trains,” Cynthia explains. “However, I do own one since I like going out and taking video of the gorgeous surrounding landscapes and villages, which you can get to only with a car.” She supplements her income by shooting stock video and offering it for sale online. In choosing to live in France, Cynthia emphasizes the importance of working remotely. Cynthia suggests that before applying for a freelance work visa in France, it is important to be able to demonstrate a strong financial position. For retirees with a steady retirement income, that should be relatively easy to do. For those who become enamored with France’s persuasive culture, world-class healthcare, and breathtaking landscapes, a path to permanent residency, and even citizenship, begins to open up after a few years.